In surgery of the hand "No man's land" is known to be the region between the proximal two-thirds of the finger and the distal inch of the palm. Here the flexor profundus, flexor sublimis which have a common synovial sheath are enclosed in a snugfitting tunnel, in which gliding is effected by the synovial fluid, like the gliding of a piston in a cylinder lined by a layer of oil. Tendon suture in this region is followed by profuse adhesion formation, completely preventing function of the finger. The term "No man's land" implies that "nobody" should perform a primary tendon suture in this region. In the introduction, a literature survey on the treatment of flexor tendon injuries in "No man's land" is given. It appears that the results of digital flexor tendon reconstruction are unpredictable and often lead to impeded function. Under favourable wound conditions and in the hands of a skilled surgeon, results of primary tendon suture appears to be quite satisfactory. To some "No man's land" should therefore be more aptly called "Some man's land". Chapters 1 and 2 review the tendon-structure, the tendon-architecture, the tendon blood supply and metabolism. In chapter 3 it becomes apparent that the basic problem in tendon healing is the impairment of the gliding function, due to the formation of adhesions, which however are necessary for tendon survival. Better results in flexor tendon surgery were obtained by closing the skin at the time of the trauma. In a later stage the profundus tendon was removed and replaced by a free tendon graft, placing both tendon anastomoses outside the digital sheath. Adhesions, developing at these sites, interfered less with the gliding function. The healing processes of such tendon autografts are discussed in chapter 4. As an alternative treatment the use of tendon allografts is discussed in chapter 5.The Cialit-stored tendon allograft appeared to offer exceptional practical and biological advantages. Accepting the fact that tendon healing is dependent on adhesions with the surrounding tissues, the use of blocking agents to prevent these adhesions, will result in no tendon healing. These efforts and other attempts to reduce the formation of adhesions are- discussed in chapter 6. In the last decade it became apparent that one of the most significant advances in reducing the incidence of adhesions after flexor tendon grafting, was the preliminary induction of a pseudosheath by an indwelling Silastic rod. It is shown both clinically and experim-mentally that tendon healing in such a vascularized pseudosheath occurs with minimal adhesion formation, resulting in better gliding conditions. In our opinion the reduced adhesion formation between tendon graft and pseudosheath, together with the encouraging results of Cialit-stored tendon allo­grafts, makes it worthwile to combine both procedures and to investigate the healing sequences of such a graft in a pseudosheath. The aims of this study, and the techniques and methods of investigations are discussed in chapter 8. In chapter 9, the results of our investigations are discussed. After studying the normal vascular anatomy and histological appearance of the calcaneal rabbit tendon, pseudosheath formation was studied under different circumstances. Then the histological appearances of the Cialit-stored tendons, at different time inter­vals are described. In the paragraphs 4 and 5 results of tendon auto­grafts and Cialit-stored tendon allografts, transplanted via a Silastic-induced pseudo sheath, are reported. In a first series of 40 rabbits a segment of the calcaneal tendon was grafted through the pseudo sheath, and sutured back in its original place. In a second series of 40 rabbits the same procedure was followed, using Cialit-stored tendon allografts. To investigate the influence of functional forces on the healing processes, the same procedures were performed in a pseudo sheath subcutaneously induced in the back of the same animal. The functional tendon grafts were immobilized for 4 weeks. All tendon allografts were stored in a 1:5000 Cialit solution for at least 3 months before use. The animals were sacrified in a one to sixteen week period after the grafting procedure. Results were interpreted from several points of view. The revascularization pattern was studied by micro-radioangiography and stereoscopically in the Microfil injected specimen. Histological appheata were studied employing light microscopical and polarizing microsco­py techniques. Histologically, longitudinal as well as cross sections stained by 5 different methods, were studied. From the results of our investigations, described in chapter 9, it appears that the normal rabbit cal­caneal tendon is constructed as a synovial tendon, with the exception that in addition to a mesotenon structure, vascular connections also exist between the paratendinous sheath and vessels in the epitenon; this system may thus be called a meso-paratenonium. Pseudosheath formation was studied around a Silastic rod, a P.V.C. (Poly-Vinyl-Chloride) tube and around a Silastic rod over which the original tendon sheath was closed. In all instances, the implant was found to induce a synovial-like membrane, without significant differences resembling the normal tendon sheath and consisting of collagenous tissue, with many capillaries and a negligible foreign body reaction. Some evidence is presented that the twelve week old fibrous pseudosheath is of inferior quality compared to the 4-6 weeks old vascular pseudo­sheath. Papillary projections, indicating a possible secre­tory function of the pseudosheath were not observed. The outer surface of the pseudosheath showed only delicate adhesions to the surrounding tissues, and the existence of a potential secondary motion plane is suggested. Calcaneal tendons stored in Cialit lose their cellular elements in about three to five months, while the original tendon architecture is retained. Revascularization of the functional tendon auto­graft grafted through a pseudosheath, was fully established in about 4 to 5 weeks. The original intratendinous vessels of the graft already showed filling with contrast medium after 1 to 2 weeks. At the sites of the anastomoses, however and in the initialy avascular tendon- and graft stumps, a well developed longitudinal vascular pattern was established after 4 to 5 weeks. Revascularization occurred by a random invasion of capillaries at the junction zones and through mesotenon-like structures along the length of the graft. The capillary proliferation, apparently derived from the pseudosheath, connected the host circulation with the original vascular system of the graft. The investigations clearly showed that the vascular system of the graft survives the operative procedure. Since a tendon is a bradytrophic tissue, survival is predictable. During the observation period, especially at the sites of the anastomoses a gradual remodelling of the vascular adhesions is noticed, until a longitudinal vascular system exists, with only delicate adhesions with the surrounding tissues. Also a few weeks after the grafting procedure a secondary motion place, as suggested to exist at the outer aspect of the pseudo­sheath, was found to be re-established. The tendon stumps played no active role in capillary and cellular prolifer­ation. As to the fate of the tendon graft, this study supports the distinction between regeneration and re constitution, already described in literature. A complete degeneration and replacement by young connective tissue was found in the graft ends, whereas reconstitution, a process of repair and survival, was found in the centre of the graft. Arguments for the partial survival of the collagenous tissue were found in the remaining strong birefringent collagenous tissue, the surviving vascular system, the maintenance of mature fibroblasts and the PAS and Van Gieson stains, which differentiate between old and new collagenous fibres. Revascularization of the non-functional tendon autograft, implanted in a pseudosheath, is fully established in about J to 2 weeks. The size of the intratendinous vessels, again indicates the survival of the original vascular system of the graft. During the observation period a gradual advancing degeneration of the tendon graft was observed, without signs of deposition of newly formed connective tissue. Simultaneously a gradual disintegration of the pseudo­sheath was noticed and after 16 weeks a small part of the original graft, adherent to the surrounding tissues, remained. Microscopic examination of these graft remnants still revealed vessels filled with contrast medium, however the longitudinal appearance of colla­genous tissue and tendon cells had disappeared. Our experiments indicate that these non-functional tendon autografts are gradually totally resorbed, which is in agreement with the experiments performed by other investigators. In conclusion, functional stimuli are found to be extremely important factors for tendon healing. Functional Cialit-stored tendon allografts, transplanted through a pseudosheath, were fully incorporated into the host in about 12 to 16 weeks. Revascularization followed a non-specific pattern. At the sites of the anastomoses capillaries infiltrated into the graft and ran over the graft surface. The anastomoses were fully recellularized and re-vascularized in about 5 to 6 weeks. After 6 to 8 weeks tortuous paratenon-like vessels were noticed between pseudosheath and tendon graft. These vessels showed some ability to stretch, so allowing movement of the tendon graft in its sheath. As was found in the tendon autografts, a remodelling of the vascular adhesions was also found in the tendon allografts, and also a secondary motion plane seemed to be re-established at the outer aspect of the pseudo­sheath. Inflammatory reactions were negligible and less pronounced than in autografts. These aspecific in­flammatory reactions, associated with cell necrosis as observed in tendon autografts, would stimulate the formation of adhesions. Since the Cialit-tendons are already in a cell-free state, these reactions are omitted, resulting in less tendency to adhesion-for­mation. 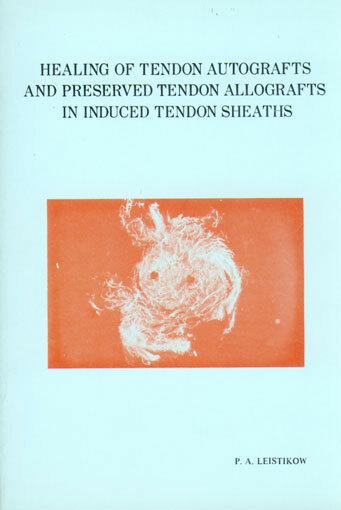 In respect to this, Cialit-stored tendon allo­grafts seem preferable to tendon autografts. Still at 16 weeks after the grafting procedure, sections, studied under the polarizing microscope, clearly revealed original collagenous tissue, in the presence of newly invaded fibroblasts. However, a gradual replacement of the whole graft by host tissue seems likely to occur and in this respect this study confirms the "Leitschienen theorie" in which the tendon allograft is said to act as a guiding structure for ingrowing host tissue cells. Recellularization and revascularization of the Cialit-stored tendon allograft is definitely prolong­ed in comparison with autografts. The non-functional Cialit-stored tendon allografts, implanted in a pseudosheath, are completely cell-and capillary free after a sixteen week observation period, while the original tendon architecture appeared to be unchanged. This finding again stresses the vital importance of functional stimuli on healing processes. No conclusions could be made as to the fate of the non-functional allograft. Cialit-stored tendon allografts are not so readily accepted and require a longer healing period: it seems necessary to prolong the immobilization period of such allografts to 5 or 6 weeks, by which time the anastomoses are well-healed. With respect to mechanical factors on tendon healing and the slight tendency towards adhesion formation in the case of Cialit-stored allografts, it may be speculated that the combination of immobilization and limited movement might offer advantages. Limited or "protective" motion might possibly be achieved by use of a dynamic splint which would allow moderate, active extension but only passive flexion. 2. In both series of functional grafts, the use of the pseudosheath technique offer several advantages which would explain the previously reported good results of its use in clinical cases. The synovium like inner face of the pseudosheath shows scant tendency towards adhesion formation and apart from permitting the tendon graft to glide in the pseudosheath, gliding of the whole tendon graft-pseudosheath complex also is possible in a secondary motion plane between the pseudosheath and surrounding tissue. In the case of tendon autografting it is advisable to preserve the mesotenon, since mobility of the graft in the sheath depends on the breadth of this mesotenon. 3. The pseudosheath plays a vital role in the survival of the tendon graft. Our own experiments indicated the partial survival of the tendon autograft transplanted in a pseudosheath. Tendon autografts transplanted out­side the sheath are described to undergo replacement, which is associated with considerable cell necrosis, resulting in aspecific inflammation reaction and greater tendency to adhesion formation. The survival of the tendon autograft in the pseudosheath should therefore result in reduced cell necrosis and subsequently in less inflammatory reaction and concommitant adhesion formation. Our experiments indicate that the 6 weeks old pseudosheath is better vascularized than the 12 weeks old pseudosheath. This finding suggests that transplanta­tion should be performed 6 weeks after the implantation of the Silastic rod. If extensive scar formation is likely to occur, the prolongation of the morbidity time through the use of the pseudosheath technique can no longer be considered disadvantageous. period, and therefore the need for a longer period of immobilization. On the other hand, in our experiments, the immobilization period never exceeded 4 weeks and distinct differences between the two series were not observed. All in all Cialit-stored tendon allografts seem to offer not only considerable practical advantages, but also biological ones. The graft is completely free of cells and histological examination revealed only slight inflammation reaction, resulting in scant adhesion formation. Het "No man's land" neemt in de handchirurgie een bijzondere plaats in: het is het gebied tussen het proximale twee derde deel van de vingers en de distale plooi van de handpalm. Zowel de oppervlakkige als de diepe pezen van de flexoren, die in dit gebied lopen, worden omgeven door een nauwe fibreuze koker, waarbij het glijden mogelijk wordt gemaakt door een laagje vloeistof, te vergelijken met het laagje olie dat zich tussen de wand van de cylinder en een zuiger dient te bevinden om beweging mogelijk te maken. Het hechten van de pees in het "No man's land" leidt veelal tot het vormen van aanzienlijke adhesies, gevolgd door verlies van de functie. De in de inleiding vermelde resultaten geven tevens aan, dat de term "No man's land" inhoudt, dat een primaire hechting van de pezen in dit gebied door "niemand" dient te worden verricht. De ontwikkeling van de chirurgie van de hand als specialisme heeft echter gemaakt, dat het begrip "Some man's land" werd ingevoerd, omdat bleek, dat primaire hechtingen verricht door ervaren handchirurgen tot redelijke resultaten konden leiden. In hoofdstuk 1 en 2 worden respectievelijk pees­structuur, pees-architectuur, de bloedvaatvoorziening en stofwisseling van de pees besproken. In hoofdstuk 3 wordt aangegeven dat het belang­rijkste probleem bij de pees-genezing wordt gevormd doordat enerzijds een verminderde glijfunctie van de pees ontstaat door de vorming van adhesies, doch dat anderzijds deze adhesievorming noodzakelijk is voor de genezing van de pees. Een aanzienlijke verbetering van de resultaten werd verkregen door bij de primaire behandeling alleen de wond te sluiten en in een later stadium de diepe buigpees te verwijderen en te vervangen door een autogeen peestransplantaat. Bij deze secundaire be­handeling wordt er voor gezorgd dat de anastomose gebieden distaal en proximaal van het fibreuze pees­schede gebied komen te liggen. De genezing van deze autotransplantaten wordt be­sproken in hoofdstuk 4. Als alternatieve behandeling wordt in hoofdstuk 5 het gebruik van allotransplantaten vermeld. Vooral de in Cialit-gepreserveerde pees-allotransplantaten blijken niet alleen aanzienlijke praktische voordelen, doch tevens biologische voordelen te bieden. De vele methoden die werden ontwikkeld om de vor­ming van adhesies te verhinderen door het isoleren van de pees ten opzichte van het omgevende weefsel, worden in hoofdstuk 6 besproken. Hieruit blijkt, dat o.m. door het implanteren van verschillende materialen de vorming van adhesies volledig kan worden voorkomen, maar dat tegelijkertijd géén genezing van de pees plaats vindt. In de laatste decennia werd een methode ontwikkeld, die erop gericht is de vorming van adhesies te vermin­deren zonder dat de genezing wordt belemmerd. In het eerste tempo van de behandeling wordt een staafje van silicon-rubber (Silastic) ingebracht. Het omliggende weefsel reageert hierop met de vorming van een pseudo-schede. In het tweede stadium, enkele weken later, wordt het staafje verwijderd en het defect in de te behandelen pees overbrugd met een autotransplantaat, dat in de nieuwgevormde schede wordt aangebracht. Zowel uit klinisch als experimenteel onderzoek is ge­bleken, dat de genezing van de pees in deze gevasculeerde pseudoschede vlot verloopt met minimale adhesie-vorming, waardoor de glijfunctie beter behouden blijft. Gegeven de beperkte adhesie-vorming tussen pees-transplantaat en pseudoschede enerzijds en de bemoedigende resultaten van in Cialit-gepreserveerde pees allo­transplantaten anderzijds, leek het zinvol beide metho­den te combineren en de genezing van een gepreserveerd allotransplantaat in een geïnduceerde pseudoschede te onderzoeken. De doelstellingen van dezestudie, met inbegrip van de toegepaste technieken en de methoden van onderzoek, worden besproken in hoofdstuk 8. In hoofdstuk 9 worden de resultaten van ons onder­zoek besproken. In de eerste paragraaf van dit hoofd­stuk wordt een overzicht gegeven van de normale anatomie, vaatstructuur en histologie van de calcaneus pees van het konijn. Hierna worden de resultaten vermeld van het onderzoek dat gericht was op de vorming van een pseudo­schede rondom een ingebrachte staaf van siliconrubber (Silastic) of poly-vinyl-chloride (PVC). Na een beschrijving van de histologische kenmerken van de in Cialit gepreserveerde pezen op verschillende tijdstippen, volgen in de paragrafen 4 en 5 de resultaten van het onderzoek dat werd ingesteld naar het ge­drag van pees-autotransplantaten en in Cialit gepre­serveerde allotransplantaten ingebracht in een door Silastic geïnduceerde pseudoschede. In een eerste serie van 40 konijnen werd na in­ductie van een pseudoschede, een segment van de cal-caneus pees als autotransplantaat gevoerd door de pseudoschede en weer ingehecht in het gecreëerde pees­defect . In een tweede serie van 40 konijnen werd eenzelfde procedure gevolgd met in Cialit-gepreserveerde allo-tansplantaten. Ter controle van de invloed van de functie op het genezingsproces werden in beide genoemde series ook transplantaten geplaatst in een op de rug subcutaan ge-induceerde pseudoschede. Alle pees-allotransplantaten werden gedurende minstens drie maanden in een 1:5000 Cialit oplossing gepreserveerd. De observatie periode bedroeg één tot zestien weken na de transplantatie. Voor het onderzoek werd gebruik gemaakt van verschillende methoden. Het revascularisatie patroon werd microradio-angiographisch en stereoscopisch na intraarteriële toe­diening van respectievelijk Micropaque en Microfil be­studeerd. Histologische lengte- en dwars coupes, ge­kleurd volgends 5 verschillende methodes, werden be­studeerd met gewone licht-microscopische en polarisa­tie-optische technieken. Uit de resultaten beschreven in hoofdstuk 9, blijkt dat de normale calcaneus pees van het konijn geconstru­eerd is als een synoviale pees, met dien verstande dat behalve een duidelijke mesotenonstructuur, tevens aparte vasculaire anastomoses bestaan tussen epitenon en paratendineuze peesschede. Voorgesteld wordt dit, systeem meso-paratenonium te noemen. Uit de resultaten van het onderzoek over de vor­ming van een pseudoschede rond respectievelijk een Silastic en PVC-buis blijkt, dat het implantaat het omliggende weefsel stimuleert tot de vorming van een op een normale peesschede gelijkende membraan, welke uit collageenweefsel, waarin zich talrijke fijne capillairen bevinden,bestaat. De vreemd-lichaamreactie bleek nihil. De bevindingen werden vergeleken met een controle-serie waarbij de bestaande peeskoker om de kunststofbuis werd gehecht. Bij observatie tot 12 weken bleek, dat de vaatstructuur van een pseudoschede uit deze periode geringer was dan na 4 tot 6 weken. Er werden geen aanwijzingen ge­vonden, dat de gevormde schede een secretoire functie kon uitoefenen. Behalve tussen de kunststof en de pseudoschede werd ook een ruimte waargenomen tussen de schede en het omgevende weefsel, die blijkens de ge­ringe hoeveelheid adhesies doet veronderstellen, dat potentieel een tweede bewegingsvlak aanwezig is. Uit het onderzoek over de in Cialit gepreserveerde pezen bleek, dat alle cellulaire elementen in de obser­vatieperiode van 3 tot 5 maanden zijn verdwenen; de oorspronkelijke peesstructuur daarentegen blijft behouden. De volledige vascularisatie van functionele auto-transplantaten, getransplanteerd in een door een Silastic staaf geïnduceerde pseudoschede, bleek hersteld in 4 tot 5 weken. Het oorspronkelijke intratendineuze vaatbed vertoont reeds na 1 tot 2 weken vulling met contrast­stof. Ter plaatse van de anastomoses en in de aanvanke­lijk avasculaire pees- en transplantaat stompen daarentegen, werd een nieuw longitudinaal georiënteerd vaatnet eerst na 4 tot 5 weken aangetoond. Revascularisatie ontstond tengevolge van een diffuse proliferatie van capillairen op de plaats van de anastomoses en door mesotenon-achtige structuren tussen het transplantaat en de pseudoschede. De van de pseudoschede afkomstige proliferatie van capillairen verbindt de circulatie van de gastheer met het oorspronkelijke vasculaire systeem van het transplantaat. Uit de verrichte onderzoekingen bleek duidelijk dat het vaatsysteem van het transplantaat de operatieve proce­dure overleeft, hetgeen, gezien het bradytrophische karakter van een pees niet verwonderlijk geacht mag worden. Tijdens de observatieperiode treedt ter plaatse van de anastomoses een geleidelijke remodellering van de vasculaire adhesies op, totdat een longitudinaal vaatpatroon is ontstaan, dat nog slechts met uiterst fijne adhesies met het omgevende weefsel is verbonden. Tevens herstelt zich na enkele weken het tweede bewe­gingsvlak. De peesstompen blijken in de cel- noch in de capillaire proliferatie een actieve rol te spelen. Wat betreft het lot van het peestransplantaat steunt ons onderzoek de in de literatuur beschreven degeneratie en reconstitutie processen. Complete degeneratie en vervanging door jong bindweefsel werd waargenomen in de marginale zones van het transplantaat, terwijl reconstitutie, een pro­ces van herstel in de aanwezigheid van overlevend collageen weefsel, in de centrale delen van het trans­plantaat aanwezig bleek. Argumenten voor de gedeeltelijke overleving van het collagene weefsel werden gevonden in de in alle fasen gehandhaafde sterk dubbelbrekende collagen vezels, het overlevende vasculaire systeem en de blijvende aanwezigheid van rijpe peescellen. De resultaten van de PAS en Van Gieson kleuringen wijzen eveneens in deze richting. De vascularisatie van niet-functionele autotrans-plantaten, geïmplanteerd in een geïnduceerde pseudo-schede, bleek volledig hersteld na 1 tot 2 weken. Ook in deze transplantaten werden aanwijzingen verkregen, dat het oorspronkelijke vaatsysteem hierbij van bete­kenis is. Tijdens de observatieperiode bleek echter een geleidelijke degeneratie van het peestransplantaat op te treden, zonder dat er aanwijzingen waren voor het ontstaan van jong bindweefsel. Tegelijkertijd trad een desintegratie van de pseudoschede op en 16 weken na de transplantatie bleek nog slechts een zeer klein restant van het transplantaat, dat adherent was aan de omgeving, aanwezig. Microscopisch toonde dit restant nog steeds vaatvulling, doch de longitudinale oriëntatie van de pees­bundels en de cellen ging verloren. De geleidelijke volledige resorptie van het niet-functionele transplantaat door het gastweefsel is in overeenstemming met de waarnemingen van vroegere onder­zoekers . Geconcludeerd kan worden, dat de aanwezigheid van functionele prikkels van groot belang is voor het genezen van de pees. Functionele, in Cialit geconserveerde allotransplantaten getransplanteerd door een pseudoschede worden in de loop van 12 tot 16 weken volledig in het gastheerweefsel geïncorporeerd. De revascularisatie vindt plaats door proliferatie van capillairen, uitgaande van de pseudo­schede. De anastomosen tonen na 5 tot 6 weken een longitu­dinaal georiënteerd cel- en vaatpatroon. 6 tot 8 weken na de transplantatie zijn paratenon-achtige vaten zicht­baar, die een gekronkeld beloop hebben en daarmede be­weging van het transplantaat binnen de schede mogelijk maken. De vaten in de anastomosen gingen geleidelijk een longitudinaal patroon vormen. Ook in deze groep werd een tweede bewegingsvlak zichtbaar tussen de pseudoschede en het omgevende weefsel. De ontstekingsreacties rond de allotransplantaten waren uiterst gering en mogelijk nog van minder inten­siteit dan de op zich zelf reeds geringe reactie rond de autotransplantaten. De betekenis van het ontbreken van deze reactie wordt besproken, mede in verband met de vorming van adhesies. Uit ons onderzoek blijkt, dat gezien de geringe neiging tot adhesievorming, de in Cialit gepreserveerde allotransplantaten, de voorkeur verdienen boven de autotransplantaten. De in Cialit-gepreserveerde pezen tonen onder de polarisatiemicroscoop na 16 weken nog duidelijk hun oorspronkelijke bouw, hoewel in dat stadium zowel volledige recellularisatie als revascularisatie aan­wezig zijn. Er zijn echter aanwijzingen dat een ge­leidelijke vervanging van het transplantaat door gastweefsel optreedt. Onze experimenten steunen de z.g. "Leitschienentheorie", die er van uitgaat, dat het transplantaat slechts dient als model voor het ingroeien van cellen van de gastheer. Uit onze experi­menten blijkt tevens, dat het gehele proces van vaatingroei en het intreden van cellen langzamer verloopt dan bij de autotransplantaten. De niet functionele in Cialit gepreserveerde allotransplantaten blijken na 16 weken nog geheel vrij te zijn van cellen en vaten. De oorspronkelijke structuur van de collagene vezels was echter nog aanwezig. Deze bevinding geeft duidelijk het grote belang aan, die de functionele prikkels voor het opnieuw ingroeien van vaten en het intreden van cellen in het allotransplantaat hebben. Over het lot van de niet-functionele allotransplantaten konden geen definitieve conclusies getrokken worden. 1. Zowel de functionele autotransplantaten als de functionele in Cialit geconserveerde allotransplantaten worden door de gastheer geaccepteerd en ingebouwd tot een vitale functionerende pees. Voor de genezing blijken mechanische stimuli van vitaal belang. In vergelijking met autotransplantaten vormen in Cialit geconserveerde allotransplantaten enerzijds minder neiging tot adhesie vorming, doch anderzijds is de wondgenezing langzamer. Het lijkt dan ook noodzakelijk de immobilisatie duur van dergelijke allotransplantaten te verlengen tot 5 a 6 weken, het ogenblik waarop de anastomose gebieden volledig ge­nezen zijn. Uitgaande van het belang van mechanische factoren voor de peesgenezing en de geringe vorming van adhesies bij in Cialit gepreserveerde pezen zou bij klinische toepassing zowel immobilisatie als beperkte beweging van belang zijn. Een mogelijkheid hiertoe wordt verkregen door het gebruik van de z.g. dynamische spalk. Deze laat een geringe actieve exten­sie toe, doch de flexie geschiedt geheel passief. 2. In beide series van functionele transplantaten blijkt de toepassing van de geïnduceerde pseudoschede bij de behandeling van peesletsels belangrijke voordelen te bieden. De door ons verkregen gegevens uit de experimenten ondersteunen de resultaten die in de literatuur bij patiënten werden verkregen. Het blijkt namelijk, dat het binnenoppervlak van de pseudoschede een uiterst geringe neiging tot vorming van permanente adhesies toont. Bovendien heeft het transplantaat niet alleen mogelijkheid tot beweging in de schede zelf, doch eveneens in een tweede bewegingsvlak, gelegen tussen de pseudoschede en het omgevende weefsel. Het is van belang om bij autotransplantaten het meso-tenon mee te transplanteren, omdat deze structuur een belangrijke rol speelt bij de beweging van het transplantaat in schede. 3. De pseudoschede heeft een belangrijke functie bij de overleving van het peestransplantaat. Uit de literatuur en eigen onderzoek blijkt, dat het grootste deel van de autotransplantaten aangebracht in een schede overleven. Autotransplantaten buiten een schede aangebracht tonen veel meer celnecrose, die op zich tot een sterkere ontstekingsreactie aanleiding geeft en de vorming van adhesies vergroot. Door de overleving van autotransplantaten in de pseudoschede zou minder celnecrose en daarmee samenhangend minder ontstekingsreactie en adhesievorming optreden. Uit ons onderzoek blijkt, dat de pseudoschede na 6 weken beter gevasculariseerd is dan na 12 weken. Deze bevinding pleit ervoor de transplantatie zelf ongeveer 6 weken na het aanbrengen van de Silastic staaf te verrichten. Het bezwaar, dat bij de toepassing van de methode van de pseudoschede de morbiditeit van de patiënt wordt verlengd vervalt indien uitgebreide littekenvorming te verwachten is. 4. Het gebruik van autotransplantaten heeft een aan­tal nadelen, o.m. de noodzakelijke tweede operatie en het feit dat bij multipele peeslaesies onvoldoende materiaal ter beschikking staat. Het gebruik van Cialit-geconserveerde allotransplant­aten heeft het voordeel dat voldoende materiaal, dat op eenvoudige wijze kan worden geconserveerd en be­waard, aanwezig is en bovendien de patiënt operaties op andere dan de getroffen plaats bespaart. Een nadeel kan zijn, dat de immobilisatie wat langer dient plaats te vinden, daar uit onze experimen­ten bleek, dat het gehele genezingsproces langzamer verliep, hoewel bij de proefdieren de immobilisatie-periode nimmer langer dan 4 weken was en door ons geen duidelijk verschil in dehiscentie met de andere groep werd waargenomen. Aangetoond werd echter tevens, dat het gebruik van geconserveerde pezen ook biologische voordelen biedt. Het ingebrachte transplantaat is geheel vrij van cellen en blijkens ons histologisch onderzoek was de reactie op dit weefsel uiterst gering. Door deze minimale reactie is de neiging tot adhesievorming beperkt.